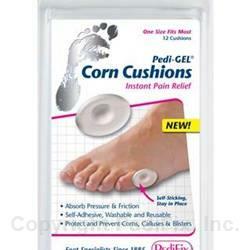 Pedi-GEL® Corn Cushions help relieve painful corns. These soft pads feature a ‘relief spot’ to protect corns from shoe pressure and stop friction. They can be worn directly on skin or inside shoes. Self-adhesive backing keeps them in place. Non-medicated. Safe for sensitive skin. 12 per pack. Wash and dry feet. Remove cushions from clear backing and apply. To remove, gently peel away from skin. Do not apply lotions, powders or medications to pads or skin when using Pedi-GEL Corn Cushions. Pads will not adhere to skin unless both are clean and dry.